They're such complex creatures, dragons. They breathe fire. They fly. They eat other dragons. They talk. They come in thousands of varieties and every culture has its own version. They're evil. They're good. They lie dormant for centuries and then awake to fulfill prophecies. They are heartless. They have consciences. They raze civilizations. They aid kings. They're invincible. They are vulnerable. They are targeted by knights. They make formidable battle-buddies. They befriend little boys who grow up and leave them behind. 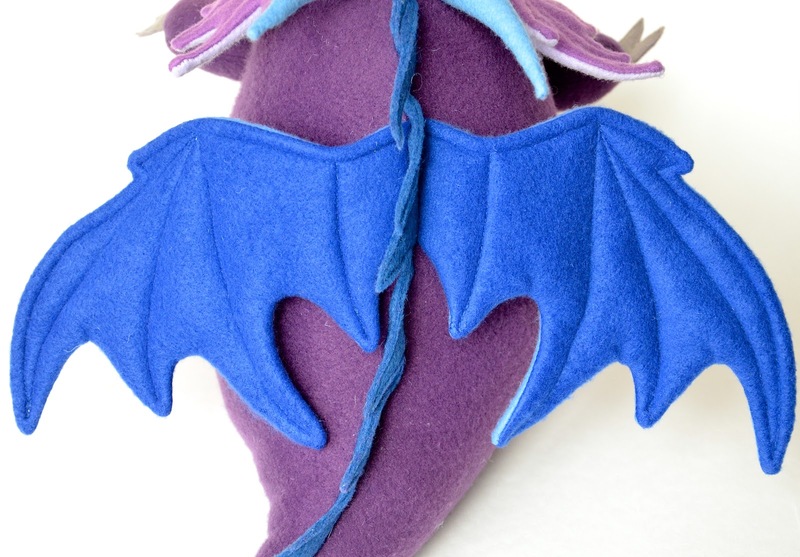 When you make a proper dragon, you know you need to stay away from cutesy. But beyond that, you are torn between hideous-and-nightmarish and noble-and-endearing. 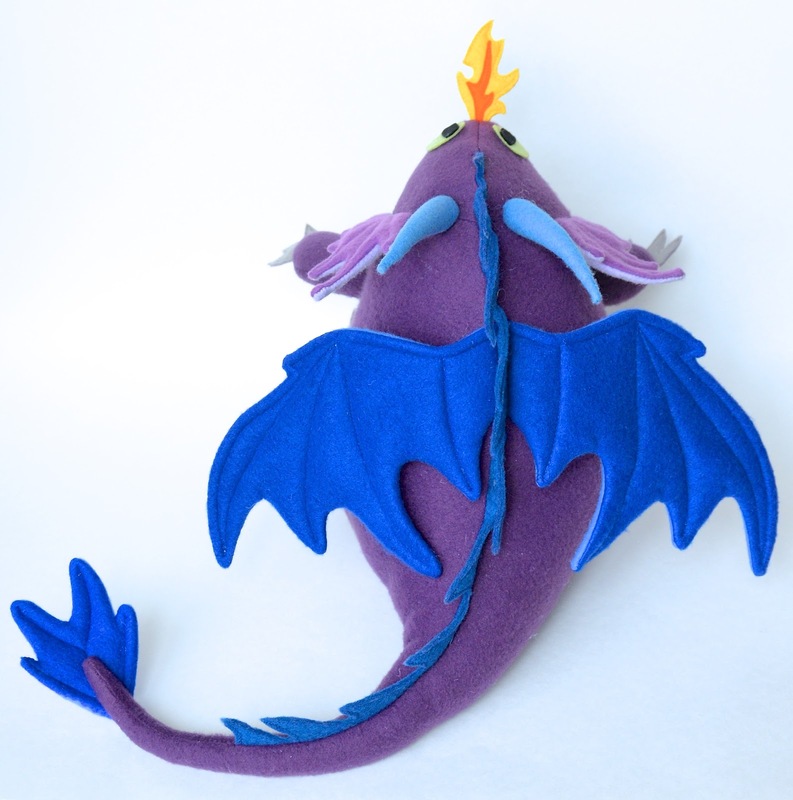 You can't, say, make a minky dragon. Or a fluffy dragon. 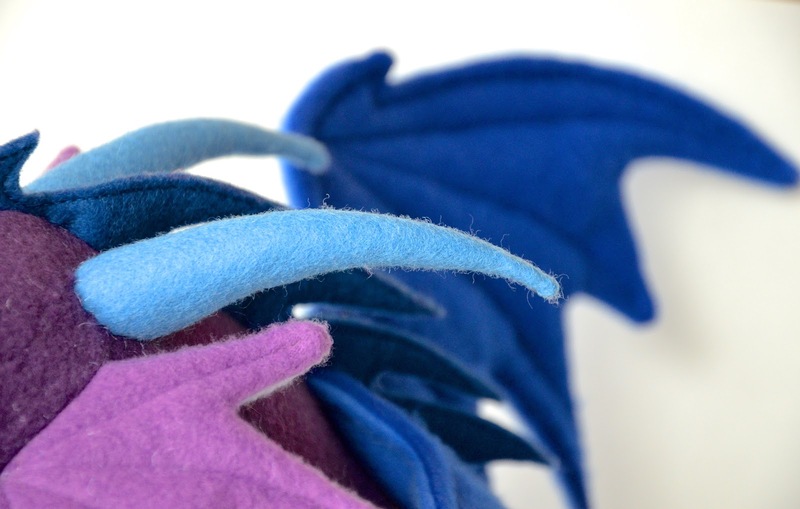 Or a pom-pom dragon. I mean, yes, you could if you wanted to, but you also can't, you know? It's like there are rules in soft-toy-dom dictating that certain creatures cannot be cutesy. Like centaurs. And T-rexes. And minotaurs. True, people have crossed that line big time with pegasus and unicorns, but dragons . 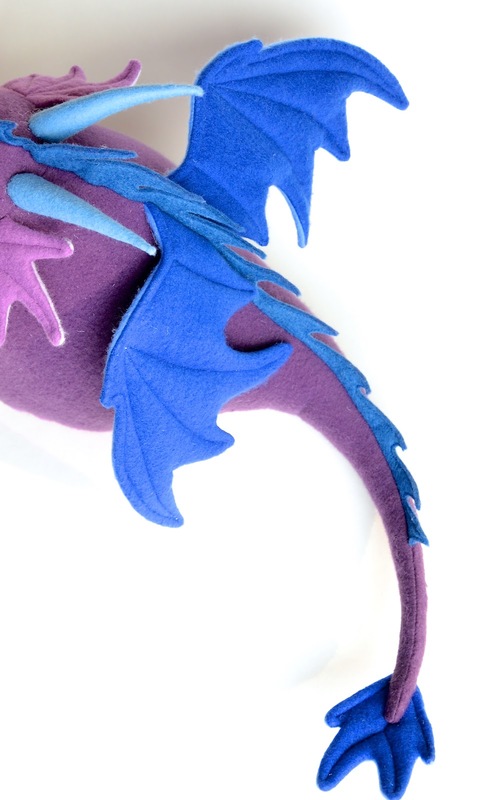 . . let's leave dragons safely on the side of fearsome and mighty, shall we? So let's talk about this dragon. Again, same base template, with a slightly different tail extension. 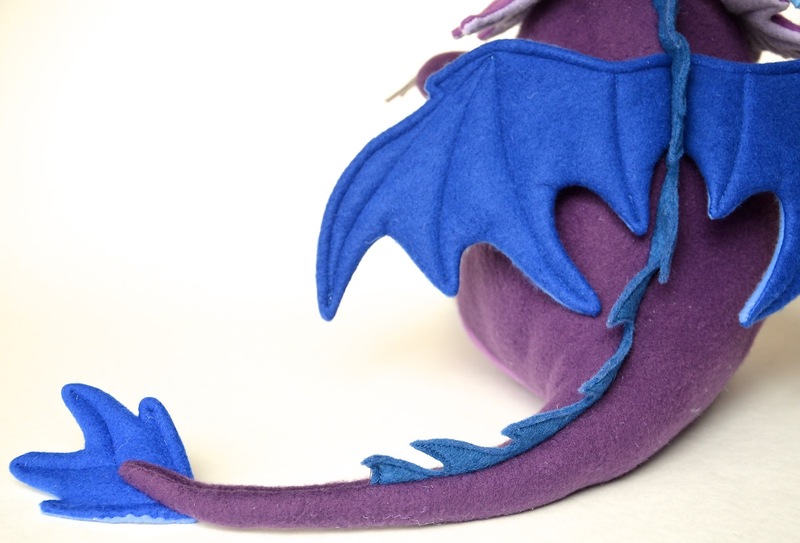 This one is a curved tail, which means the two body halves are not symmetrical, and have to be eased together along the spine so they meet at the end. I'll show you how in the pattern. and horns that curve if you want them to. P.S. Anyone noticed his eyes are funky? They're not attached! 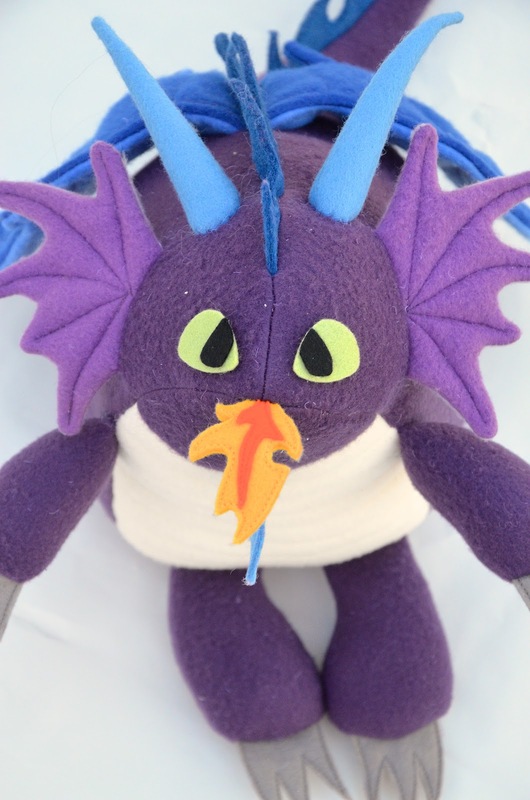 I'm so silly - it's so hard to get a good dragon face that I refused to glue on (let alone pre-stitch) his eyes so I could keep repositioning them until I saw one that I liked. What's especially hilarious is how I keep losing the eyes as I lug him around the house for photoshoots. Or when the children come into the sewing room to say hello and hold him (they don't seem to care that he's dangerous) and they leave with one of his eyes hanging onto their shirt sleeve. I will eventually permanently adhere his eyes, but for now, they're sitting safely in a box on my sewing table. I really like the colors you chose. So if I'm checking, this is species #18, where it all started. Does this mean the pattern is coming soon? The wait is killing me! Now I REALLY want this pattern. Hopefully by spring break, so I can focus on crafting for a week? 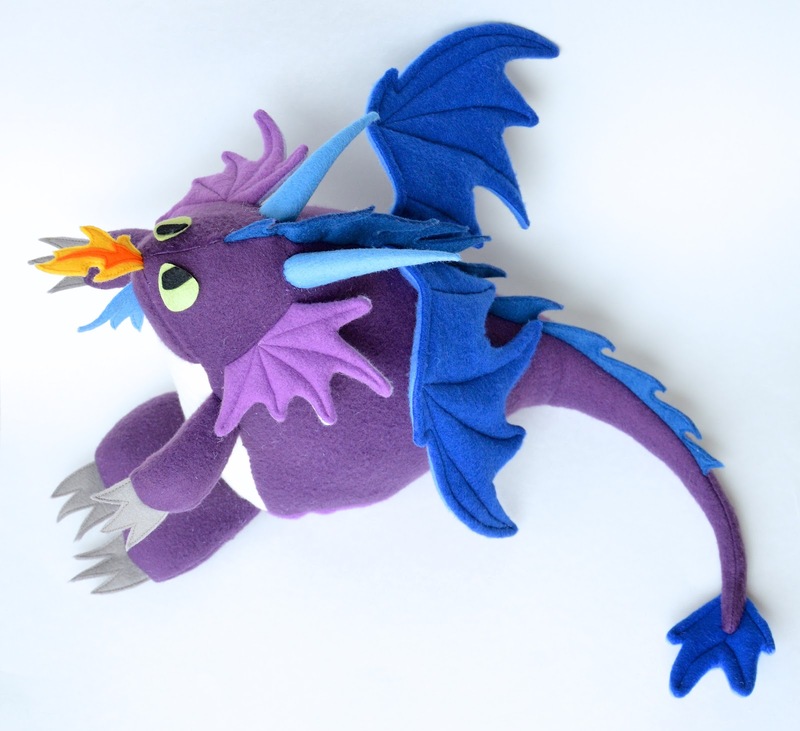 This is an awesome dragon! 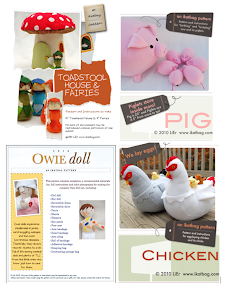 Can I just ask, what kind of fleece (if there are different kinds) do you use to make your softies? The only fleece I have used has pilled badly and I want to make some toys for my boys but want them to look good after the first cuddle. Thanks! Ashley: yes, there are different kinds of fleece, and some are lovely and some are absolutely horrid. I hardly ever buy fabric online and even then, only quilting cotton, because while there are different grades of quilting cotton, it's still the same fabric - cotton, woven, no give. All other fabric I buy in person, so that I can examine the surface and stretch and thickness and so on. So even in telling you the kind of fleece I use, I'd still recommend actually touching fleece fabric in stores before you buy it, because you can't tell just from the name/brand/variety online what you'll actually be getting. when I'm making small softies, like the spring bunnies, I like microfleece. I've bought it by the yard in fabric stores, and I've also cut up clearance scarves from Old Navy made of microfleece, too. When I have the time make the drive, I'll buy polar fleece. Polar fleece 100 is the thinnest (and the number increases with the thickness and level of insulation) and just a little thicker than blizzard or no-pill fleece. It has a velvety, almost suede finish, and very plush without feeling furry - the darker purply-grey fabric in my squid is polar fleece 100, if you'd like a look. Both sides of polar fleece are identical, and the pile is thick and lovely. If I don't want to take the time, I just stop by JoAnn and pick up non-pill or blizzard fleece. Depending on the color, sometimes one kind is better than the other. By "better", I mean that the finish is smoother and less pilly (yes, even the non-pill fleece feels furry to the touch sometimes). 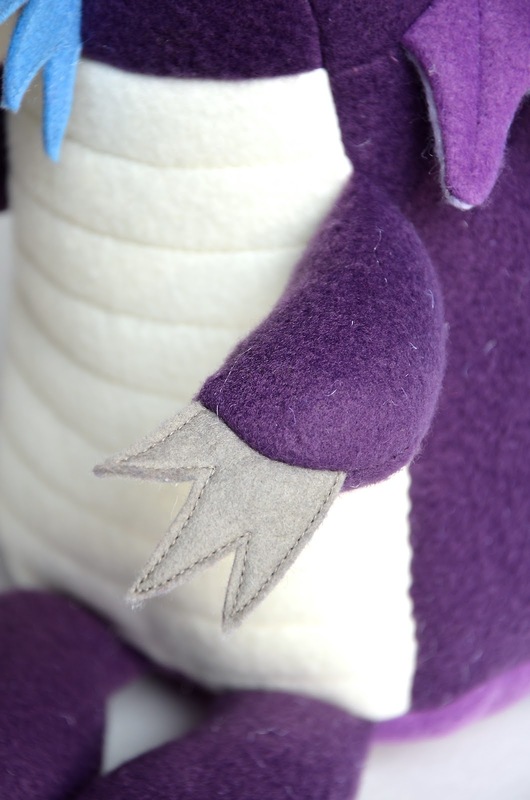 When I sew with blizzard, non-pill fleece or microfleece, I pick as the RS the side that looks smoother and less pilly. Sometimes both sides are pretty similar that it's hard to tell them apart, but sometimes it's very obvious which side will degenerate in the wash.
thank you for your reply! I was already wondering what kind of fleece I can use best. At my local shop the choice of fleece is not big and looks not like the best quality. Time to start looking for other good shops! 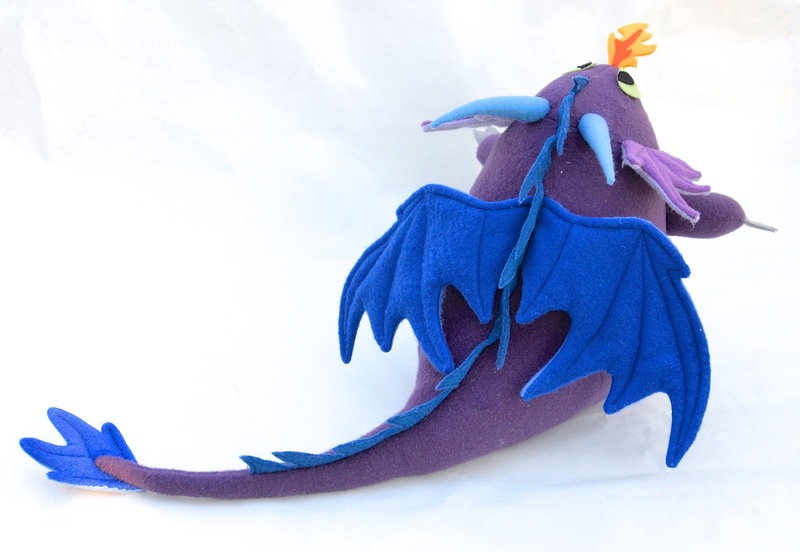 Absolutely yes on dragons needing to stay on the dangerous and dramatic side of the line with stuffies :). 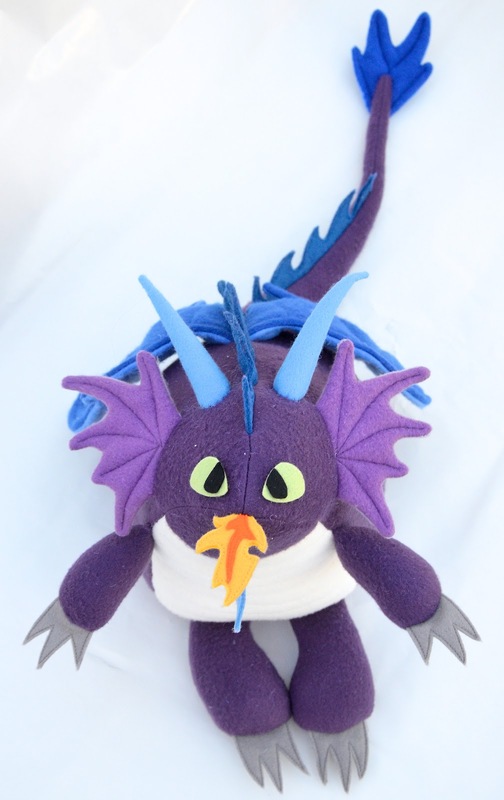 Also, these daily stuffie posts have been such a highlight of my last couple weeks! I know it's a tremendous amount of work for you, but I'm loving it! 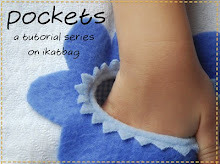 Thanks for sharing, and I can't wait for the pattern. I adore your Dragon ! 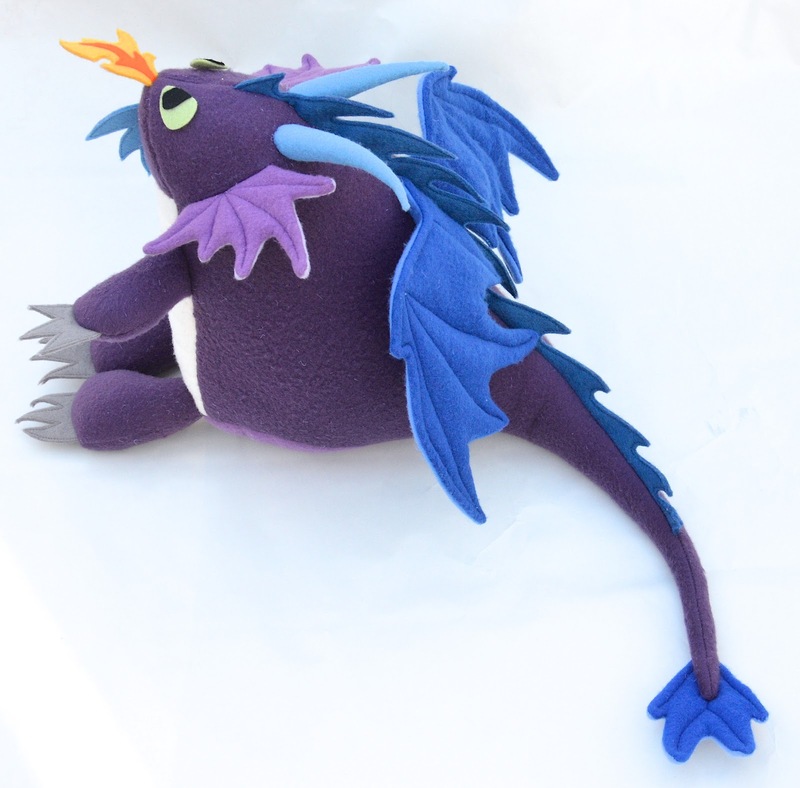 Your dragon is fabulous!!! The eyes are well worth getting just right - and you did it. Raccoon on Sew Mama Sew!